We’ve reached the last CSA for 2011. The box is filled with roots and squash to nourish and fill you up during the colder, darker days. 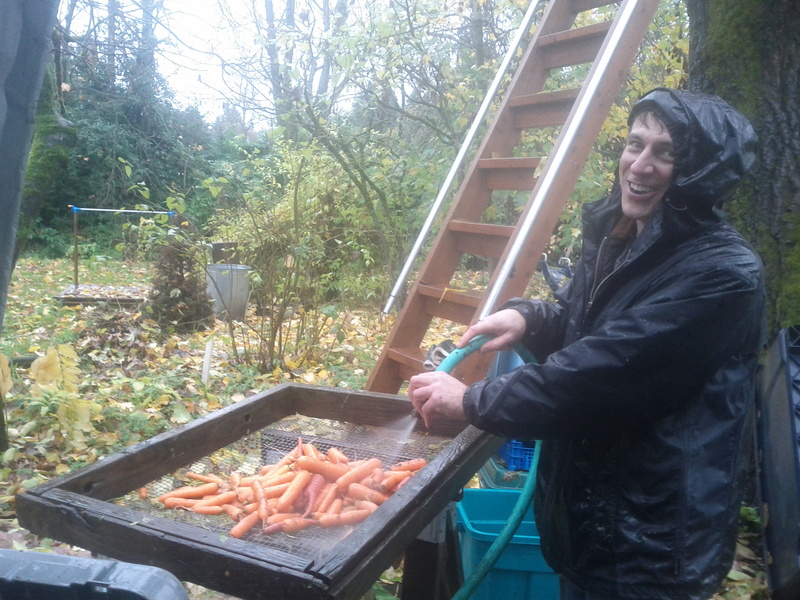 Several volunteers braved the rain and came out to pick the harvest. It was fun and celebratory. We pulled up the rest of the carrot and parsnip row, which didn’t take long because the nutria had come in the last week and cleaned out a few! This was the first sign of them this year since the blackberry habitat was taken down this winter. 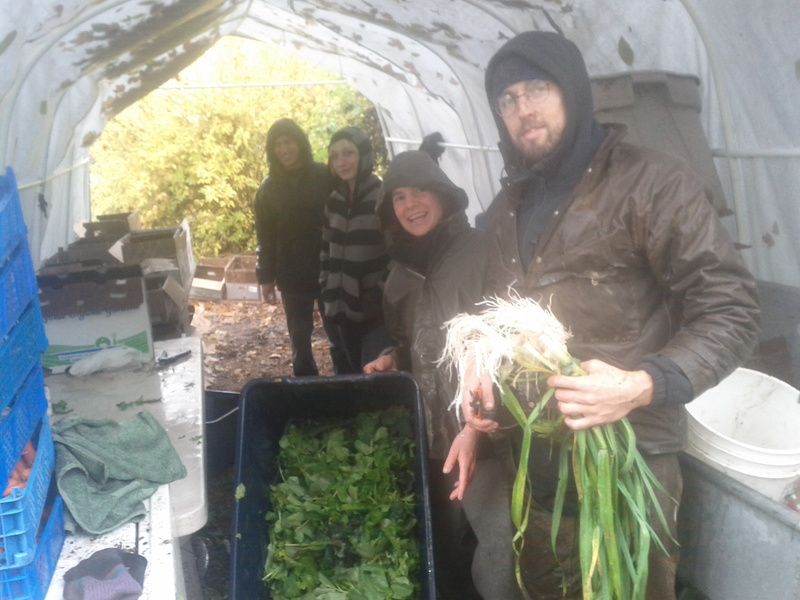 We’ll still be out sporatically this winter, covering a few rows with leaves and burlap sacks, cleaning up, planting microgreen flats in the propogation house and doing restaurant harvests.It’s already time to get planning for next year’s projects too. I hope this winter you all stay well and are able to relax some. Be on the lookout for a CSA survey next week. Thank you so very much for your support of your local farm! Braising Mix – Brassicas, fava bean tops, and endive. Great sauteed like other greens. Winter Squash – Butternut, kabocha, or delicata. Heat a heavy bottom large stock pot over medium heat. When pan is hot add 1 Tb oil, onion, garlic and 1/4 tsp sea salt. Stir to coat the onion and sweat the onion on medium heat until soft and translucent. Chop the braising mix into 2 inch chunks. You can pull the leaves off of the midribs or leave them intact if you want to save time. The leaves and mid ribs are small and not too fibrous right now so the choice is yours. Add the braising mix and the 2 cups of water/broth. Stir frequently for 1-2 minutes to get all the greens wilted and wet. Cook on medium heat for 10 minutes. Uncover and give the greens a stir. At this point they should just be peeking out from the liquid. Leave the pot uncovered and cook for 10 more minutes. Meanwhile use a vegetable peeler to make long ribbons out of your carrots. Shoot for about 1 cup of carrot ribbons. Add the carrots, garlic powder, red wine vinegar, 1/4 tsp sea salt, and 1 Tb olive oil. Stir to combine and simmer for a couple more minutes. Place the daikon in a large bowl and sprinkle with the salt. Refrigerate for 30 minutes. Drain daikon. Stir in the garlic, onion, egg, bread crumbs, pepper, paprika, and chili garlic sauce. Mix well. Form into 8, small round patties. Pour oil into a large skillet. Heat over medium heat. Fry patties in the hot oil until firm and nicely brown, about 3 minutes per side. Drain on paper towels. I hope you’re all staying healthy! I’m recovering from several different bugs. Now I’m well:) Cold and wet! For the first time this fall, the soil was goopy and muddy. 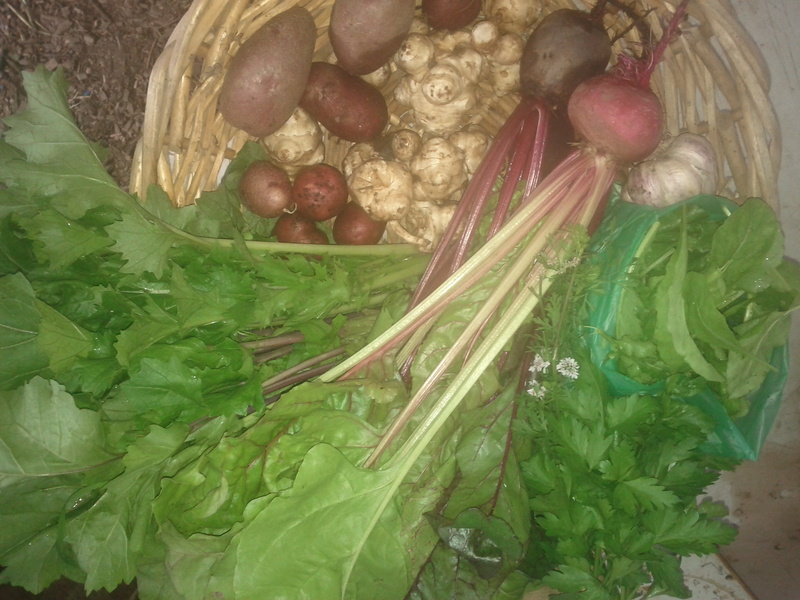 We scraped off the precious topsoil that came up with the roots while harvesting for the CSA. I loved seeing earthworms and red wigglers busy at work, seen in abundance in every turn of the soil. I really felt winter coming yesterday on the farm, as the leaves had fallen and the farm was starting to look “naked.” Sleepytime is coming! However we were busy harvesting, the ducks and sheep moved about munching and preening and different birds flew about catching perhaps their last eat before heading south. It was exciting to pull rutabaga and the baby leeks for the first time this season, having waiting 4-5 months since planting. 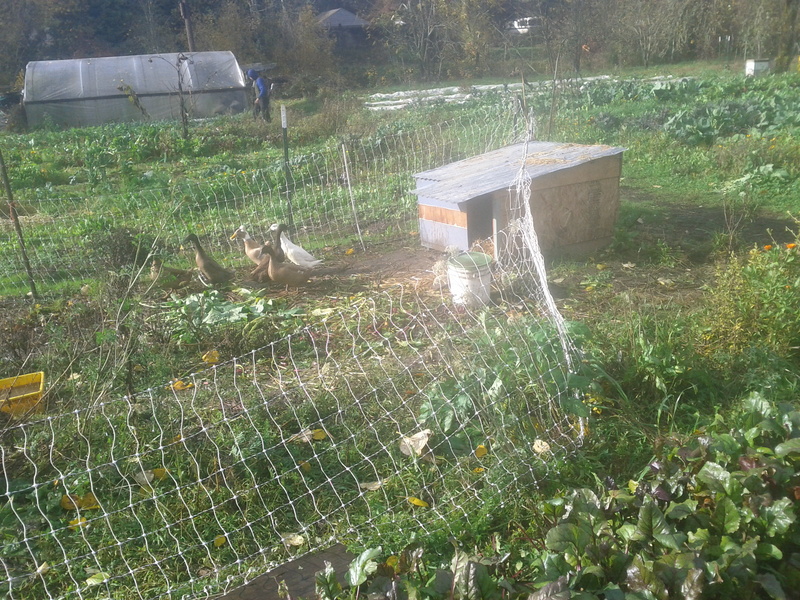 We also harvested some medicine, dandelion root, while weeding the remaining patch of the garlic bed before planting. This is a great time to dig up roots or move roots as the energy has moved into that part of the plant. Developing larger medicinal beds is one of our upcoming projects. 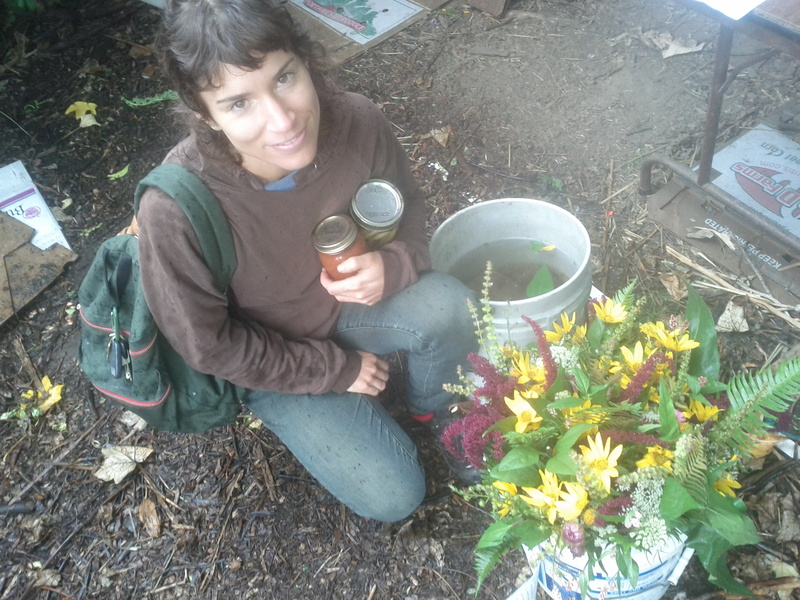 We’ll be moving medicinals like elecampagne, valerian, and motherwort from friends’ gardens and farms in coming weeks to expand much needed medicine propagation to heal our communities and the earth. Leeks – If you are fighting sickness or need to warm up, make a brothy leek soup! Mushrooms are great immune boosters to add too. Rutabaga – The large root with purple and yellow, unlike the turnip in the box which is deeper purple and white. They were bred as a cross between a cabbage and turnip. Like turnip in taste, with a starchier texture, they are a great addition to root roasts. They are also super hardy to cold temperatures and can overwinter. This time of year I love to warm up with a hearty bowl of soup. It’s a great way to use the roots and green and squashes too. For a simple dinner, present this flavorful soup with some warm crusty bread and a mixed green salad. Heat oil in heavy large pot over medium-low heat. Add leek, celery and garlic and sauté until vegetables begin to soften, about 5 minutes. Add turnips, rutabagas, potatoes, carrots, tomatoes with juices and 2 cans broth. Bring to boil. Reduce heat; cover and simmer until vegetables are very tender, about 45 minutes. Transfer 4 cups soup to processor. Puree until almost smooth. Return puree to pot. Add remaining 2 cans broth; bring to simmer. Season with salt and pepper. Ladle soup into bowls and serve. Melt butter in a large saucepan over medium heat. Stir in the onion, and saute until tender. Mix in the potatoes and radish greens, coating them with the butter. Pour in chicken broth. Bring the mixture to a boil. Reduce heat, and simmer 30 minutes. Allow the soup mixture to cool slightly, and transfer to a blender. Blend until smooth. Return the mixture to the saucepan. Mix in the heavy cream. Cook and stir until well blended. Serve with radish slices. 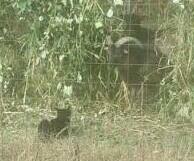 Diego the kitten checking out the sheep..he was testing them! Hi Everyone! We had such a beautiful time harvesting this month’s full moon. 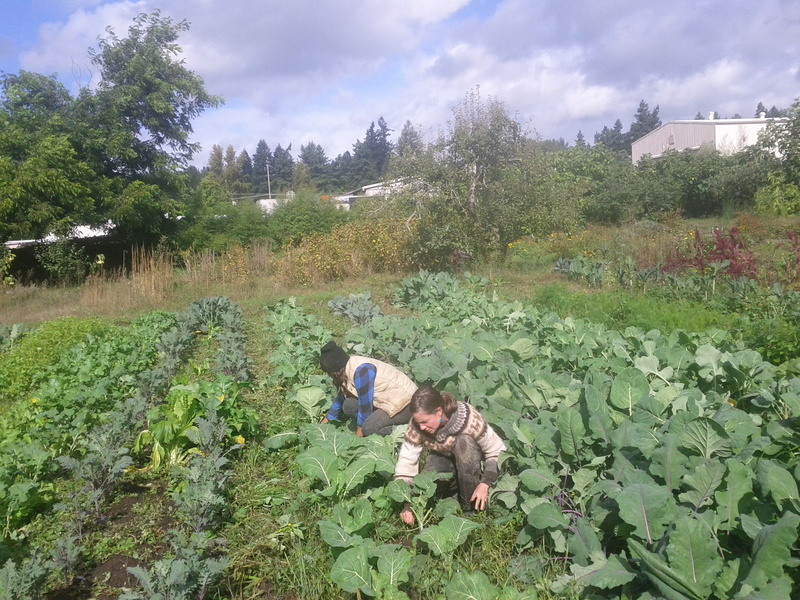 We put a few more fall beds to sleep through pulling the ends of the beet and carrot row for your CSA box. The carrots are mulched by their tops and the beets we’ll soon put leaves when more have fallen. I love to rake the leaves, hearing the crunch on some dry days or even more familiar to me, raking the gushy saturated leaves. 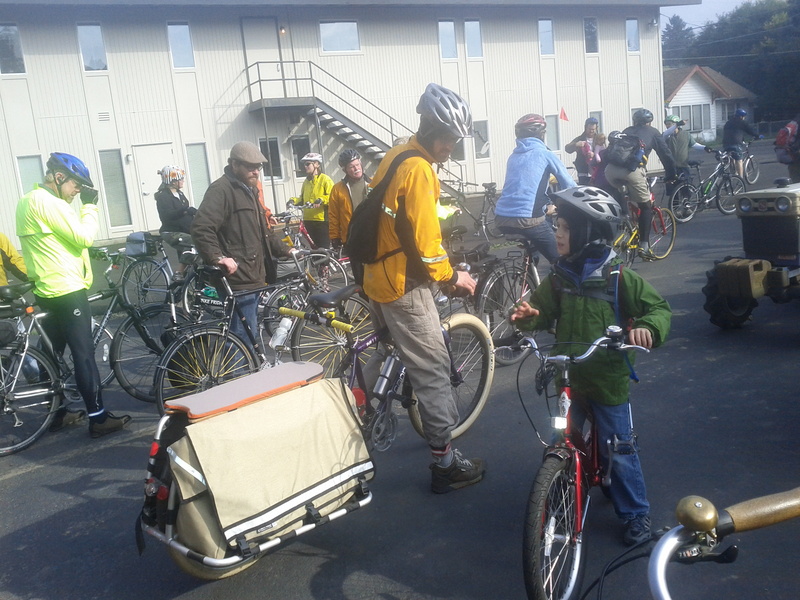 Yesterday’s gorgeous weather brought people outside. Shane and Crista moved the sheep to new ground. Diego, a teenage black kitten/cat pounced and played outside, engaging with the outdoors on his first week outside. I have a feeling he will be a good rodent hunter! He’s a real joy. And Ryan was busy mulching young trees. It was refreshing to have some children volunteers helping with the harvest. They did a great job picking roots with their Dad. The ducks snoozed all nestled in the remaining basil plants as we walked back and forth carrying harvests. After the harvest I planted a bit more garlic in the most delicious soil. The section we planted a few weeks ago has really taken root too! The greens have slowed down as the days shorten and the temperatures drop. Unfortunately, looks as if the brussel sprouts and broccolli will not be ready until after the CSA ends. I was hoping they’d be ready for your final boxes. They were slow to go even though I got them in on time in late July. Hopefully in the last week the mini purple cabbages will be ready. 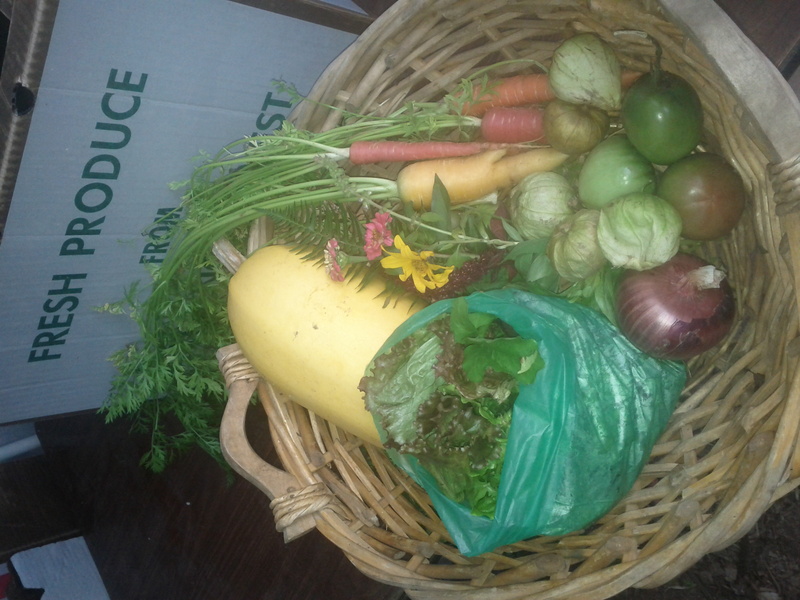 We’ve really loved growing this produce for you and I hope you’ve enjoyed being part of the CSA. We will send out a survey in a few weeks and would really appreciate the feedback. Thanks for your support! 2 more weeks left after this one. I forgot to take a picture of the box again, oops! Daikon – It’s the large white asian radish. Again, like other brassicas, you can eat the greens. Daikon is delicious in soups, pickled, or grated into salads. I like to chop the greens small and throw them into a brothy miso soup for just a few minutes. Beets – w/greens. Golden, chioggia, red and yellow cylindrical. They didn’t want to get very big this year so we have smallish beets. Great for cutting in quarters and preparing your favorite way. Cipollini – These are the candy of the onions. They smaller, flatter and sweeter. They are great roasted. If cutting it’s best to half or quarter as their shape makes other cutting difficult. Rub an earthenware (or pyrex) gratin dish with smashed peeled garlic and butter. Layer overlapping slices of potato cut 1/8 inch thick. Season with salt, pepper, and thyme leaves (if on hand). Moisten with cream, cream and chicken stock, or milk to the level of the top layer of potatoes. According to taste, sprinkle the top with grated Parmesan cheese or Gruyere cheese, and distribute thin shavings of butter on top. Bake 45 minutes to 1 hour in a preheated oven at 375°, until nicely browned. Many variations are possible: potato and rutabaga, potato and celery root, potato and butternut squash, potato and leek, or potato and sweet potato. Try adding a layer of some other delicious thing between the potato layers: sorrel, roasted garlic, sautéed wild mushrooms, caramelized onions, kale or chard, black olives, artichoke hearts. Ponzu is a citrus Japanese sauce with soy. . . Combine all ingredients in a bowl. Cover and chill. Grate 1 medium daikon and mix in sauce. How to make your own homemade souffle with beets, fennel, garlic, whipping cream, mozzarella cheese, egg yolks and whites, flour, and milk. This baked dish is great for parties or family dinners. This recipe serves 4. Preheat oven to 350 F (180 C). Put beets and fennel on a cookie sheet and bake for 45 minutes until cooked. Add garlic cloves at about 10 minutes before cooking time is complete. Meanwhile, add all-purpose flour to the margarine until a thick paste has been formed. Slowly add the milk until the paste becomes thinner and thinner, but not lumpy. A runny sauce should be formed. Season with salt and black pepper and slowly heat until thickened, stirring continuously. Set aside until needed. Peel beets and dice. Using a food processor, combine beets, fennel and garlic. Add salt, black pepper and egg yolks. Beat until smooth. Fold in the egg whites until smooth. Pour beet and fennel mixture into a greased soufflé dish. Bake for 20 minutes until golden on top. Serve hot with a selection of choice vegetables for a family reunion or party with friends. This sauce can be used over vegetables, polenta, or fish as well as pasta! 1. Before preparing sauce, fill a large casserole with water, and bring the water to a boil. 2 Wash and clean well the arugula and parsley. Dry thoroughly. Trim and chop both the arugula and the parsley. 3. Place the arugula and the parsley in a food processor. Add the yogurt or sour cream, goat cheese, salt, and pepper. Blend the ingredients thoroughly. Keep the sauce at room temperature until ready to use. 4. Add a pinch of salt to the boiling water, and cook the fusilli noodles following the instructions on the package. When the noodles are cooked, drain them, and place them in four serving dishes. Pour the sauce evenly over the top of each serving and add some cheese to each dish. Serve immediately. ** Last box is Wednesday Nov 23rd, because of Thanksgiving. I will post box contents by Nov 16th so that you and plan Holiday meals accordingly. Chilly Fall Greetings! I’m surprised by how many leaves are still hanging on the trees at the farm. However each day brings dramatic color changes. 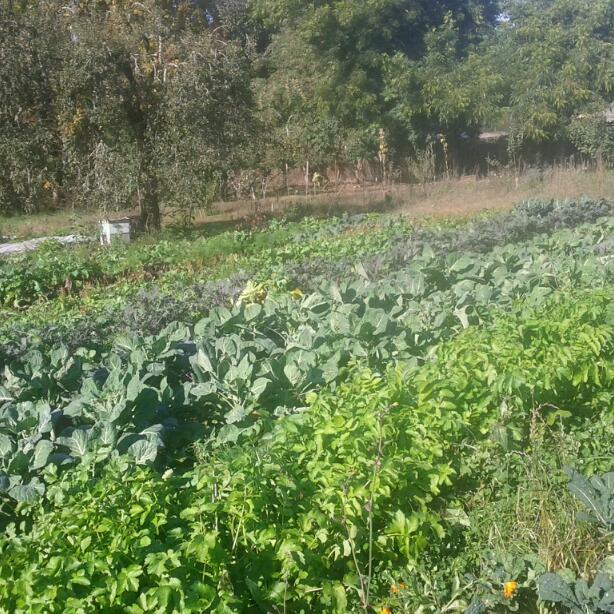 In the vegetable field the fall and winter crops remain vibrant greens and are still putting on new growth. The cover crops are popping up ranging from 2 to 16 inches. Frost has hit the farm several night and the roots and greens will become ever so sweeter. Some of the lettuces that were fully exposed survived the frost which seems pretty amazing to me! Our farming schedule has adjusted as the crops require way less maintenance. We put the garlic in last week; a delight to seed. Each clove you stick 1-2 inches in soil makes a head:) It’ll start to set roots this winter and stay in the ground until next July when we harvest again. 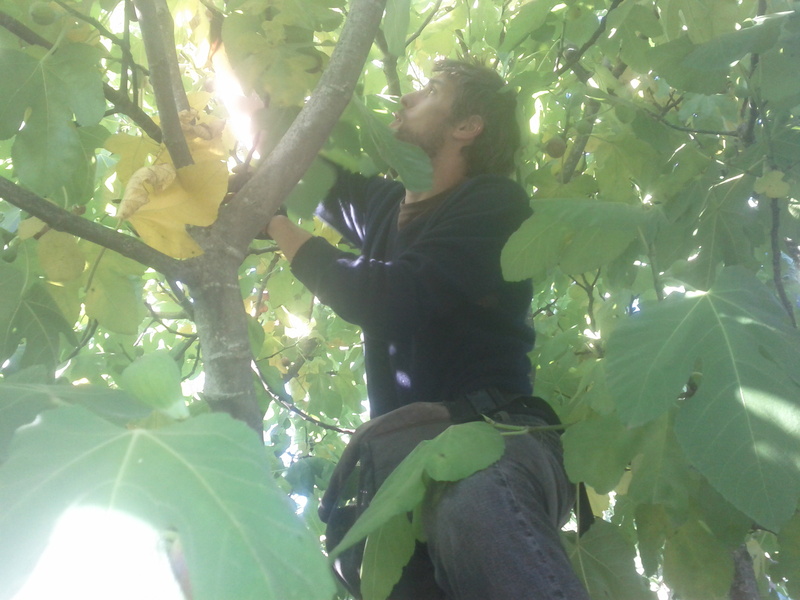 We’ve been harvesting, cleaning up and starting to plan for adjustments to next years farm. It’s been nice to slow down and also start dreaming of new projects and refining systems. Okay, let me get to what’s in the box! There’s a few delicious items you might not be familiar with . . .
Chesnuts – Oh I love how nourishing, sweet and nutty they are! To prepare, make a slit in the shell so they don’t burst. Roast in oven at 400 for 45 minutes or on medium heat in cast iron skillet, stirring occasionally for 20 minutes or so. Keep in fridge or they will dry out. Parsnips – The off white, cream colored carrot looking root crops are parsnips. One of my favorite cold weather root, they are again so nutty, sweet and have their own unique flavor. Prepare like other roots. They pair well with any other roots, apples, black beans, cooked greens, lentils, onions, oranges, prunes, raisins, tofu, brown sugar, honey, and maple syrup. Radish – easter egg varieties. I’ve been enjoying grated radishes on salads. Salad Mix – A hearty near 3/4 pound of fresh greens! Melt butter in a 3-quart heavy saucepan over low heat, then stir in celery, carrot, and onion. Cover surface of vegetables with a buttered round of wax paper or parchment (buttered side down) and cover pan with lid, then sweat vegetables 15 minutes (to soften). Wrap parsley, cloves, and bay leaf in cheesecloth and tie into a bundle with string to make a bouquet garni. Discard buttered paper from vegetables, then add broth and bouquet garni and bring to a boil. Reduce heat and simmer, covered, 20 minutes. Add chestnuts and Madeira and simmer, covered, 3 minutes. Purée soup in small batches (4 or 5) in a blender until smooth (use caution when blending hot liquids), transferring to a 3- to 4-quart heavy saucepan. Stir in cream, pepper, and salt to taste and reheat soup over moderate heat, stirring occasionally. Cooks’ note: Soup can be made 2 days ahead and cooled, uncovered, then chilled, covered. I rarely think to eat them raw, but check this out! 1. In a large bowl, combine the sour cream, onion, parsley, lemon juice, sugar, 1/2 teas salt, and pepper to taste. Stir until well combined. 2 Mix in the parsnips and apples. Cover and refrigerate for at least 2 hours. 3. If you are using the nutes, toast them in a dry, heavy skillet (preferable cast iron) over high heat until they start to brown in spots and become fragrant. Immediately transfer the nuts to a dish to cool. 4. When you are ready to serve, taste the salad and season with additional salt and pepper if desired. Sprinkle on the nuts. Serve chilled. Farmer was very sick for several days didn’t get to blogging. I hope you are nourished! Finally the figs are ready! Sunchokes – Also called Jerusulam artichokes. These delicious tubers are in the aster family, which is the same as common plants like lettuce, artichokes, calendula, and sunflowers. The stem and leafy part of the plant tower 10-13 feet tall with small yellow flower “bursts of sun” that opened when the overcast skies became more frequent in late september. Sunchokes have some health benefits “Because normal digestion does not break inulin down into monosaccharides, it does not elevate blood sugar levels and may, therefore, be helpful in the management of diabetes.”(Wikipedia). Delicous thinly sliced and steamed, sautéed, or roasted. If boiled they become mushy. I hope you enjoy their nutty, sweet artichokey nature. Arugula – Yummy! A combination of an early September planting and “a – rougula”; wild volunteers from previous plantings:) Great wilted or fresh. Cook both the potatoes and sunchokes until soft, about 15 to 20 minutes. Put the shallots in a large bowl. Add the vinegar and water and whisk in the oil. Drain vegetables and while they are still warm toss with the vinaigrette. Allow the salad to rest for 10 minutes so the vegetables absorb the dressing. Stir in parsley and/or bolting cilantro-coriander and serve warm. Season the fish with the lemon zest, thyme, and parsley. Cover, and refrigerate at least 4 hours or overnight. Remove the fish from the refrigerator 15 minutes before cooking, to bring it to room temperature. Heat a large sauté pan over high heat for 2 minutes. (Depending on the size of your pan, you may need to cook the fish in batches or in two pans.) Season the fish on both sides with salt and pepper. Swirl the regular extra-virgin olive oil into the pan and wait 1 minute. Carefully lay the fish in the pan, and cook 3 to 4 minutes, until it’s lightly browned. Turn the fish over, lower the heat to medium-low, and cook a few more minutes, until it’s almost cooked through. Be careful not to overcook the fish. When it’s done, the fish will begin to flake and separate a little, and the center will still be slightly translucent. Remember, the halibut will continue to cook for a bit once you take it out of the pan. Scatter half of the arugula over a large platter. Arrange the beets on top, and drizzle with half the horseradish cream. Tuck the rest of the arugula among the beets, so you can see the beets peeking through. Nestle the fish in the salad, and spoon a little horseradish cream over each piece. Drizzle the whole dish with the super-good olive oil and a big squeeze of lemon. Tomatillos – They are green and have a husk. Tomatillo plant grows like tomatoes. They have a much longer self life than tomatoes and make a great salsa. Green Tomatoes – You can leave them on countertop to ripen or fry them up. The dark spots on some are from the cold weather. Spaghetti Squash – Most of them 4-5 pounds so have your friends over for “spaghetti” dinner. Spaghetti squash are a winter squash, but differ than most other varieties in that they have a higher water content and when cooked the flesh separates into spaghetti like strands. It is a good replacement for pasta. Basil – This time for real it’s the last picking. We salvaged the last leaves that don’t have blackening from the cold weather. Enjoy! Flower Bouquets – Volunteer Amy made the sweetest bunches. She bounced around the entire farm finding all kinds of beautiful plants to go in the bouquets. The magenta is amaranth, the yellow flowers are from the sunchoke plants, a root you will find in future boxes. Dry roast tomatillos (leave husks on) and sweet peppers on cast iron until some spots blackened, stirring occasionally. It takes 5-8 minutes. (Other option is to roast the tomatillos (de husked), garlic ,onion and pepper in oven, turning once). Cut garlic and onion clove into 4 or 5 chunks, add the rest of the ingredients and blend until smooth. Let marinate 30 minutes before serving. Keeps about a week in the fridge. Place spaghetti squash cut sides down on the prepared baking sheet, and bake 30 minutes in the preheated oven, or until a sharp knife can be inserted with only a little resistance. Remove squash from oven, and set aside to cool enough to be easily handled. Meanwhile, heat oil in a skillet over medium heat. Saute onion in oil until tender. Add garlic, and saute for 2 to 3 minutes. Stir in the tomatoes, and cook only until tomatoes are warm. Use a large spoon to scoop the stringy pulp from the squash, and place in a medium bowl. Toss with the sauteed vegetables, feta cheese, olives, and basil. Serve warm. Slice the tomatoes into 1/4 – 1/2-inch slices. Salt and pepper them to taste. Dip in meal and fry in hot grease or oil about 3 minutes or until golden on bottom. Gently turn and fry the other side. Serve as a side dish – delicious with breakfast!